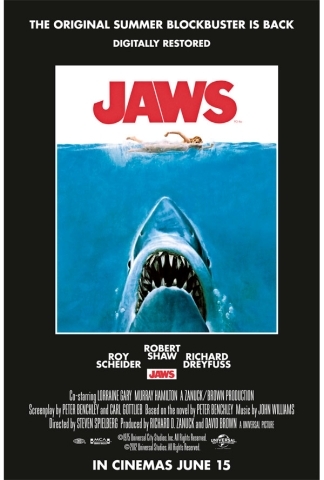 Jaws returns | The Cineaste's Lament. Here is one of those frankly unexpected treats that feel unreal even while you’re sitting in the dark watching the film being projected on the silver screen- Jaws returning to the cinema (a limited release to tie-in with a remaster/Blu-ray release in a few month time). Well, even though I’ve seen the film many times, and have the Blu-ray steelbook on preorder, how could I possibly resist the opportunity to see this film back on the big screen? Especially as its one of my favourite films and the scariest experience I ever had in a cinema as a kid back in 1975.